In the launch of our new weekly feature we will be bringing you bands that deserve that extra spotlight, that we think will be a name you will be hearing a lot more of, hopefully, in the not too distant future. And to kick off our inaugural Fresh Thursday we bring to you: BlackWaters. An absolute cracker of a punk rock band hailing from Guildford, they have been together since 2014 and are set to release their latest EP in May with currently 7 songs available to stream on Spotify. They have already supported bands like Marmozets, Barns Courtney and Yonaka as well as previously appeared at The Great Escape Festival and Camden Rocks where they will be appearing again this year as well as performing at the Neighbourhood Weekender. If loud punk is your thing and you like bands from Frank Carter & The Rattlesnakes to The Bronx then definitely give these guys a listen! SikTh, British Sea Power, The Rifles and a shedload more announced for Camden Rocks! Camden Rocks, the one day festival that is set to takeover Camden have just added more bands to their brilliantly, huge line up. 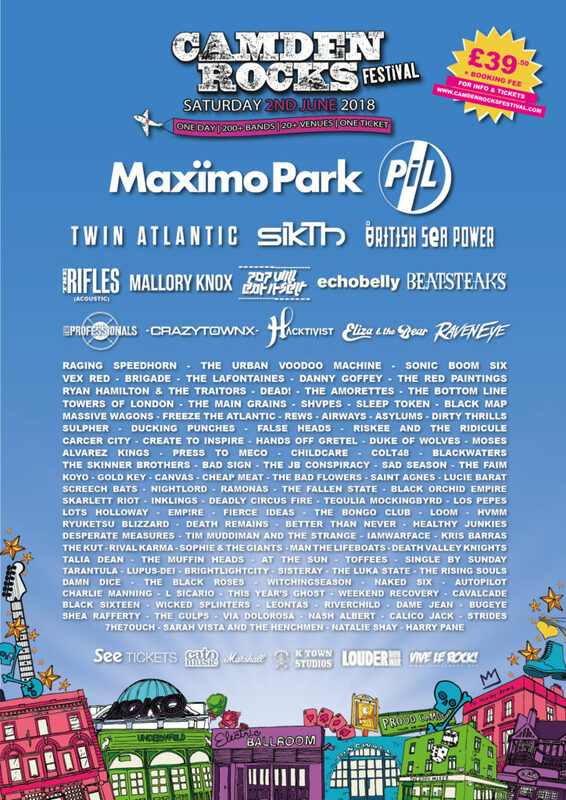 Brighton rockers British Sea Power and prog metal band SikTh among 41 other rock bands have been added to the list where they will be joining the likes of Maximo Park, Public image Limited and Twin Atlantic on their stacked bill. Other additions from the latest announcement include Echobelly, Danny Goffey, The Rifles, Eliza and the Bear, RavenEye, The Faim and plenty more that were all hand selected by the organisers to join the huge day of music. The full list of bands announced are: Sikth, British Sea Power,The Rifles (Acoustic), echobelly, Eliza and the Bear, RavenEye. Vex Red. The LaFontaines, Danny Goffey, The Amorettes, Black Map, Rews, Dirty Thrills, Sad Season, The Faim, Saint Agnes, EMPIRE, LOOM, AutoPilot – UK, Tim Muddiman & The Strange, Iamwarface, Kris Barras Band, Man The Lifeboats, Brightlight City, The Luka State, DAMN DICE, The Black Roses, NAKED SIX, L Sicario, This Year’s Ghost, Weekend Recovery, Cavalcade, Wicked Splinters, LEONTAS, RiverChild, Bugeye, Shea, The Gulps, Via Dolorosa, Nash Albert, Calico Jack, Sarah Vista And The Henchman and Harry Pane. Camden Rocks are also offering the chance for a band to play the main stage on the day with their band submission competition, where one lucky band will be able to join the bill and play at the KOKO venue. For a chance of having a spot on the bill you can submit here. Posted on March 22, 2018 Author Sam DawesCategories NewsTags Camden, Camden Rocks, featured, FestivalLeave a comment on SikTh, British Sea Power, The Rifles and a shedload more announced for Camden Rocks! The legendary Isle of Wight Festival just got bigger with 18 more acts announced! Just when you thought the Isle of Wight line-up for 2018 is already pretty decent, the additional 18 acts announced yesterday have definitely launched this event among the must-see festivals this summer! So, to recap – with a carefully selected variety of captivating headliners including Liam Gallagher, Kasabian, The Killers and Depeche Mode as well as The Script, Van Morisson, Blossoms and James Bay announced back in December, the Isle of Wight was already off to be an unmissable event. 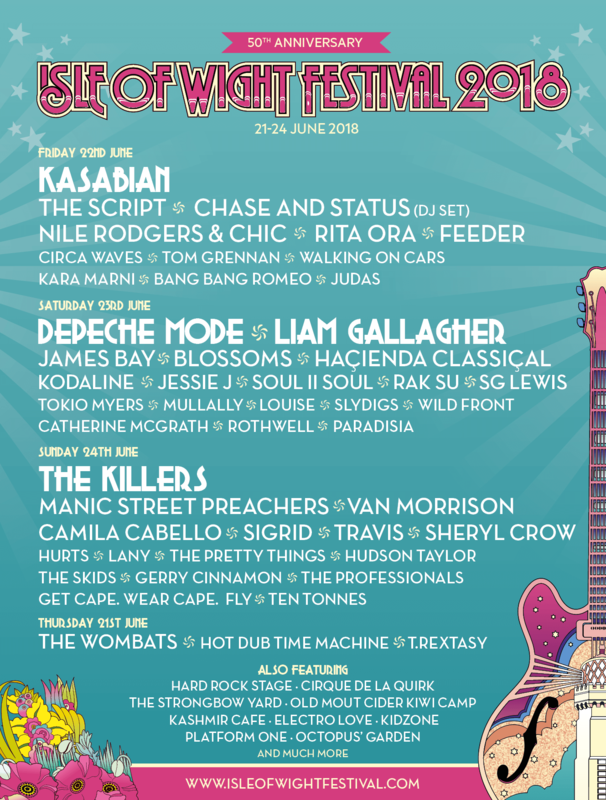 But this was not all – another wave of acts was announced in February, that included the likes of Manic Street Street Preachers, Camilla Cabello, Soul II Soul, Feeder, Rita Ora, Tom Grennan, The Skids, Tokyo Myers and Circa Waves to name a few. Then, yesterday, 21st March, marking the start of the 3 month countdown, 18 more acts will be joining the stage, including Thursday, 21st June, headliners The Wombats, Sigrid, Travis, The Pretty Things, Paradisia and many more. Celebrating it’s 50th anniversary, the Isle of Wight has gathered a collection of the highest quality, most well-known and loved acts and artists and is determined to make this year’s festival one that no one can afford to miss! Posted on March 22, 2018 Author Izzy MagyarCategories NewsTags Announcement, featured, Festival, Isle of WightLeave a comment on The legendary Isle of Wight Festival just got bigger with 18 more acts announced! Many more names added to the Neighbourhood Weekender line-up! Black Honey, King Nun and The Night Cafe are among the second wave of acts added to the sold out show at Victoria Park in May. 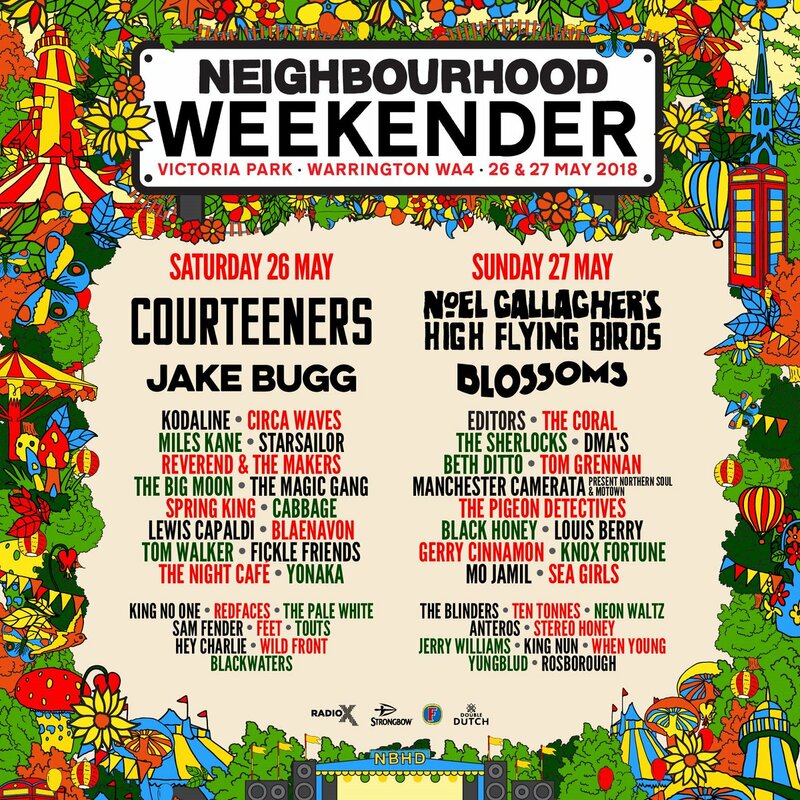 The new additions join headliners Noel Gallagher’s High Flying Birds and Courteeners as well as Editors, Blossoms, Circa Waves, The Sherlocks and many among others. Other names added to the bill are Yonaka, Ten Tonnes, Touts, Tom Walker, Blackwaters and other upcoming names! The festival takes place over the bank holiday weekend of May 26 and 27 which promises three stages along with a hub of local food and drinks. Posted on March 21, 2018 March 21, 2018 Author Ross HallsCategories NewsTags Announcement, featured, festivalsLeave a comment on Many more names added to the Neighbourhood Weekender line-up! The Great Escape announces 100 new acts to it’s 2018 line-up! The Great Escape unveils new names for it’s 2018 festival with Milk Teeth and Sun Arcana amongst the latest additions. The Brighton event expands every year, with 2018 set to be it’s biggest yet adding more names to the legendary new music showcase. Ecca Vandal, Lady Bird, White Room, Marsicans, Plaza, Pale Seas, Cassia and loads more are set for the bash. The end of last month they unveiled the likes of Tom Grennan, The Faim, Goat Girl, The Night Cafe, and Sea Girls for its three day Brighton takeover. According to the festival’s booker Adam Ryan, they’re not done yet either so watch this space for more line-up news. The Great Escape will take place across multiple venues from 17th-19th May. For tickets and more full line-up, visit here. Posted on March 21, 2018 March 21, 2018 Author Ross HallsCategories NewsTags featured, the great escapeLeave a comment on The Great Escape announces 100 new acts to it’s 2018 line-up! With a career spanning 44 years which produced 17 albums, all of which hit the UK top 40, The Stranglers brought their definitive tour to the Norwich UEA. A tour compiled of what they class as definitive Stranglers, collating the best of their extensive back catalogue to the stage as a treat for their fans that have been with them over the years. Special guests Therapy? kicked off the night bringing their heavy alternative guitars and sheer likeable characters to the stage. They constantly interacted with the crowd and done their best to get some form of reaction from a fairly unconvinced crowd. It’s a shame as at a different show they may have gotten a warmer reception. It just felt, however, that they may have been a tad too heavy and too late to be touring with The Stranglers and if it were a decade or two before, I feel like their style would have been welcomed a lot more. To their credit, they didn’t give up and recline to just playing their set, but carried on allowing their personality to shine through. They dedicated ‘Die Laughing’ to the late Ken Dodd and directly after dedicated ‘Callow’ to Stephen Fry, giving a bit of recognition to the fact he is local to Norwich and has been enduring a tough time with Prostate Cancer. As their set drew on, showcasing their heavier guitars with some of their songs being more punk than most, lead singer Andy Cairns mentioned that it was drummer Neil Cooper’s birthday asking ‘is there any where to party in Norwich on a Monday night?’ after that was met with a resounding no, he and bassist Michael McKeegan got the crowd to chant ‘Neil, drum like a motherf*cker’ before they rounded off a strong set. As the lights went down once again for the headliners of the evening, the screens lit up, showing off their recognisable logo, accompanied with photos of each member that has been on the tour posters. The start didn’t quite go as expected, just as lead singer, Baz Warne, was about to launch into the opening song ‘Curfew’, technical difficulties struck with his guitar which was, unfortunately, not working. With the crowd beginning to smirk and look around as to what is happening Warne simply stated ‘oh f*ck off’ to the enjoyment of much of the audience as he was eventually suited with a replacement guitar. Once Warne’s guitar was sorted, they launched into ‘Curfew’ and then straight into ‘Get a Grip on yourself’ with the screens behind the band accompanied by the lighting showing off the level of production they brought with them for their ‘Definitive’ tour, treating fans to a show of the highest visual order with photos and video appearing on the screens in perfect synchronisation with the music. For the set itself, it was a mixed affair, a stream of reasonably up beat, melodic songs played out including favourites like ‘Norfolk Coast’ and ‘Peaches’, the flow was then halted as they played ‘Don’t Bring Harry’ which felt a tad premature in the set, slowing the tone right down to a subdued level just as the crowd were beginning to heat up. This pause though did act as a perfect way to go into another fan favourite ‘Golden Brown’ arguably their most famous song, with lighting befitting of the song, the pace soon picked up as did the audience, with reception to each song becoming louder as the night grew on. For a band full of personality, it was a rather subdued performance, playing each song without much pause in between and without any interaction, it felt like someone pressed play on a greatest hits compilation and that was what you got, their definitive songs but not a definitive performance. With tickets having gone on sale over a month ago, the colourful Beautiful Days Festival has finally announced this year’s headliners, and it absolutely does not disappoint! Returning to Escot Park, in Devon, between the 17th and 19th August, Beautiful Days promises a riot of color as its Sunday theme, encouraging people to ‘be bold, be bright-wear every colour of the rainbow’! Not only this, but the line-up is one to make it a must-see on your list of festivals this summer. Headlining the main stage are Manic Street Preachers on the Saturday and festival founders – the Levellers, who will be closing the weekend, as well as other acts such as Shed Seven, Gogol Bordello, The Wildhearts, Dreadzone, The Ska Vengers, A Tribe Called Red, The Spitfires, Ducking Punches and there for the first time, indie rock band, Feeder. Suzanne Vega, Calexico and folk legend, Richard Thompson Electric Trio are headlining the Big Top Stage, and will also be joined by Rising Appalachia, Les Negresses Vertes, Oysterband, 3 Daft Monkeys and North London siblings, Kitty, Daisy & Lewis. However, there still is more to come with the Friday Main Stage headliner expected to be announced in June, as well as line-ups for The Bimble and The Rebel tent and more stand up comedy acts to be revealed for the Theatre tent.